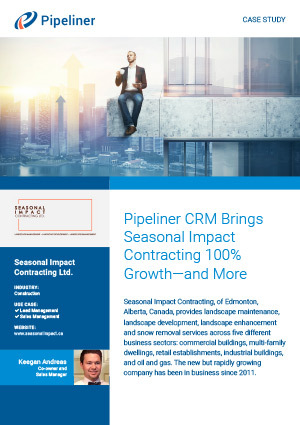 Seasonal Impact Contracting, of Edmonton, Alberta, Canada, provides landscape maintenance, landscape development, landscape enhancement and snow removal services across five different business sectors: commercial buildings, multi-family dwellings, retail establishments, industrial buildings, and oil and gas. The new but rapidly growing company has been in business since 2011. Customer Service Highway. This is the stage in which the service is delivered and the customer is made happy. Win. Service paid for. “I don’t consider the project a win until the customer is happy and has paid us,” Andreas says. Andreas, who also serves as one of the company’s salespeople, knew that if the company was going to utilize its sales process and truly grow, a robust CRM solution was needed. “We were using Microsoft Excel, personal notebooks and white boards because we’re a fairly new company we’d never had a CRM program before,” Andreas reports. But the most significant change has been to the company’s bottom line. “With Pipeliner, we don’t need to spend those countless hours going through spreadsheets or creating formulas,” Andreas concludes. “We can click a button, figure out the report, view it and analyze it, and then refine from there. The company has learned the importance of a sales process… With a help of Pipeliner CRM.